Click on Pictures Below to See Enlarged Views! Shown above is men's/women's "Cody Coat". 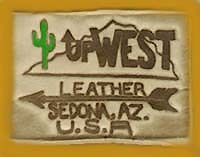 Designed from handmade palomino deerskin with X stitching & beads. Available as shown or with collar. Shown above is a mahoganny elk "Cody Coat", extra long with rattlesnake vertebrae beads. Shown above is the custom hand made, white ladies fringed leather jacket. Please do not hesitate to share any additions you may wish to make.